Cost at Launch - $200.00 (which quickly became less than $100). What can I say about this system? There is a good chance that you have not even HEARD of this system. This is one of the reasons that I have decided to write this book. I wanted to educate and inform people about the obscure systems. I have to admit that when this system came out that I did not purchase it. I eventually purchased it 20 years after it hit the market and only because I am a collector of videogames. If I were going to purchase it strictly on its merits then it definitely falls short. There are a few unique qualities to this system, but other qualities seem to roll right from the other gaming systems which were out at its time. Aesthically it reminds me of the Intellivision systems. Its controllers have the similar bubble keypads and it has a small joystick on a disk-like controller. 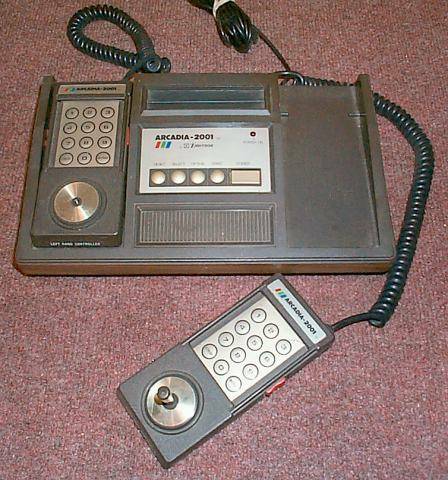 The developers thought they were going to bring out a “Super Atari 2600 – like” machine. Well it quickly turned into a huge failure and a big piece of crap. It fell victim to the Atari 5200 and the Colecovision systems. This system reminds me of why we have copy protection laws. Most of the games were basically rip-offs of the popular games of its time. Can you guess what game “Alien Invaders”, “Missile war”; “Super Gobbler”, “Robot Killer”, “Spiders” and “Crazy Gobbler” were based on. It reminds me of what happened to Donkey Kong, when some idiot made a “Krazy Kong” clone. There is a huge lack of creativity if you are going to just bring out a rip-off version of a game. This is one of the reasons that this system failed. On top of that, its competition was much more advanced and was at least a million times more creative than the developers for this system.